West Roswell Elementary - Multi-Use Path? It looks like the City of Roswell is doing the right thing and going to the Fulton County School Board to request an easement for a multi-use path along Hog Waller Creek. The request went before the school board tonight and I'm not sure of the outcome yet (will update). The path would be 10 feet wide. Here's an image of where the path would run. 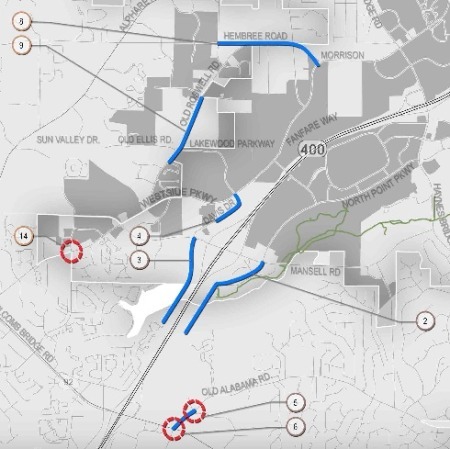 If this is approved, the next step would be to connect it down to Norcross St. That would be a great step toward connectivity and toward making some safe routes to school for kids to walk and bike. View from Ison Dr. Imagine this view from Alpharetta St. I'm not sure the side of the new school is much of an improvement. School Architecture - A school should be more than a box where we house our kids during the day... it should inspire learning. It should not look like a dorm or an office building or an apartment building. When you see it, you should be able to tell that it is a school. That's not something that we see much of these days. Milton High comes to mind as good architecture for a school. 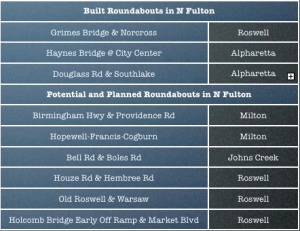 The school we are getting will be a cookie cutter version that Fulton County is using quite frequently these days. It will be the same as Ison Springs Elementary and Lake Forest Elementary in Sandy Springs. The architect architect was Collins Cooper Carusi and the builder was Evergreen Construction. You can see some wedding day photos of their work here. I call them wedding day photos because the school is never going to look any better. They actually have some very nice work in their portfolio. Unfortunately, our school probably won't be one of their best. All that said, the interior design of the school will likely be very good. Learning by Design rated that design as an outstanding project for 2011. At a minimum, the school design needs some work on the exterior to give it a distinct Roswell feel. School Walkability - Roughly 50% of kids walked to school in 1969. As of 2009, that number had dropped to roughly 15%. Of course, in the same period, the number of kids who are driven to school in private vehicles has jumped from 12% to 44%. Just one more thing contributing to the obesity epidemic in our country. Will this school help reverse that trend? I highly doubt it. In this day and age, schools are designed to accommodate bus traffic, car traffic and then foot traffic. 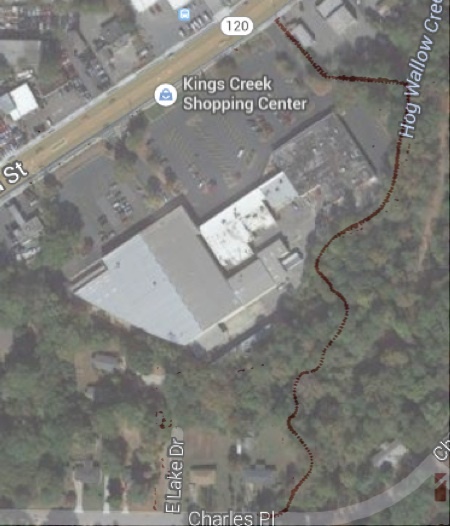 Given that a quarter mile walk is generally the radius in which someone will choose to walk versus jumping in the car, we are significantly limiting the number of students who would likely choose to walk and finding sites that meet these requirements in already built out cities is increasingly challenging (and expensive). With these size requirements, you might figure that size is a requirement to delivering a top notch education. However, that's not necessarily the case. Take Inman Middle School in the Virginia Highland neighborhood as an example. It's a solid school with a 9 out of 10 rating on GreatSchools.org but it's situated on only 2.5 acres. With almost 800 students, that's about 17.5 fewer acres than the state of Georgia would require if a new school were to be built. Our new school will be on roughly 14 acres along hwy 9. The districting has not been determined yet so we can't say where the students would be walking from. But, we can safely say that kids residing on the west side of hwy 9 will probably not be walking to school. Those that have to walk along hwy 9 will also probably not be walking to school. Any students living more than a half-mile walk from the front door of the school will also probably not be walking. So, this rules out a sizable chunk of the potential students. No wonder new schools create traffic concerns. All the students have to ride or be driven and it's almost exclusively due to the site location and site size requirements. If we want our new school to be a walkable, neighborhood school, we have a lot of work to do. I'll also be writing a piece on the school in my Community Design Matters column for the Sept edition of The Current. 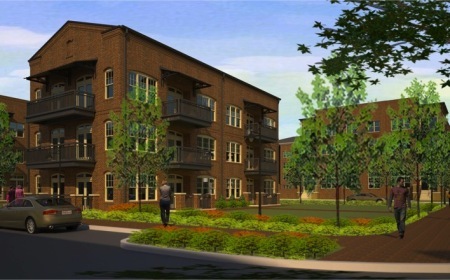 Last night, Andres Duany of DPZ, presented three amazing neighborhood village concepts for Historic Roswell along with a quick fix for Barrington Hall to increase its visibility. These concepts have been refined over the past two weeks to incorporate community input that came from two days of public workshops last month. The ideas enhanced by visuals are absolutely incredible. He reviews all of them in this video. I will be posting images from the slideshow over the next several days and will continue to post new images as the planning process progresses. There was a lot of positive energy in the crowd and I believe these visions will leave a realistic and lasting impression on what Historic Roswell can become. Please share this with anyone who is interested in making Roswell a better place! This is the 14th post in a series of posts this December that will chronicle the 25 things we would most like to see in Roswell. None of these are actually happening... at least in the way we'd like them to. Please enjoy and have a happy holidays! This is one of my favorites on the wish list. Every day when I drive up Atlanta Street, I pass the Presbyterian church on the left and Krispy Kreme on the right. The intersection at Atlanta and Oak Streets is pretty barren except for those two landmarks. As most of you know, the Presbyterian church has a large parking lot that Oak Street dead ends into and then on the west side of that lot is the Teaching Museum North and North Crossroads school. What if we could do something with that entire space and bring a logical civic presence into the heart of the historic district? Look at the size of the space on the Google map below. I would envision either a charter elementary/middle or a county run elementary school in this location. The main entrance would be on Atlanta street. This would be a grand facade in Greek revival style to complement the historic homes in the area such as Bulloch and Barrington Halls. The bus and car entrance would be along Mimosa however to ensure that traffic along 9 is not impacted during the morning rush hour. As far as design goes, I really just don't get how our country started designing its schools in the same vernacular as its prisons. No wonder our educational standing in the world keeps falling. The first image below is that of the Clinton Middle School in Tulsa, OK. This particular image was the Eyesore of the Month on James Howard Kunstler's blog back in March 2010. 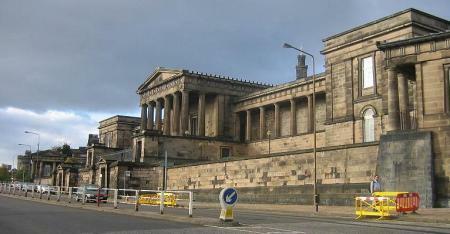 After that, take a look at the Royal High School in Edinburgh, Scottland which was designed in the Greek Revival style in the early 1800's. Which one of these two buildings is going to inspire more learning? The topography and size of the lot would require a multiple story school most likely on top of parking. The parking would be shared with the church in the evenings and on Sundays. It could also be used to provide extra space for city events. I know this one is just a dream but if Roswell is going to focus on the Atlanta Street corridor for growth, a new elementary school is going to be vital. I believe that focusing on education and giving it a prominent position in the community in the heart of the historic district will pay dividends for years to come. Here's a great blog post on school size and design from Stephen Mouzon that focuses on Providence High School in the Village of Providence. Here's another excellent post from Kaid Benfield at NRDC on Great Principles for Smart Growth Schools. This is the 12th post in a series of posts this December that will chronicle the 25 things we would most like to see in Roswell. None of these are actually happening... at least in the way we'd like them to. Please enjoy and have a happy holidays! This is part of my Complete Roswell kick. Most great cities, big or small have a reputable university campus within their city limits. The university doesn't have to be world class but it should be more than just a vocational college or two year community college (although that would be preferable to what we have now). So, what are the options? Ga State expanded early last decade to Alpharetta. Another case where the sprawl mecca to our north beat us out. I actually went to that campus for a semester when I was working on an MBA. It was no fun. It just didn't feel like college. It felt more like work. I guess that is appropriate since the campus is in an office building. I highly doubt Ga Tech would be looking to expand but they are definitely starting to run out of room downtown, having jumped the connector with offices and classrooms along Spring Street. Emory isn't going anywhere. What does that leave? Well, it looks like Gwinnett Tech is looking for a North Fulton location and our neighbors are also interested. Don't get too excited though because it looks like Johns Creek or Alpharetta may have the upper hand. The empty parcel just south of North Point Parkway and Mansell Rd is a prime spot. So, once again, Roswell will be close but not close enough. 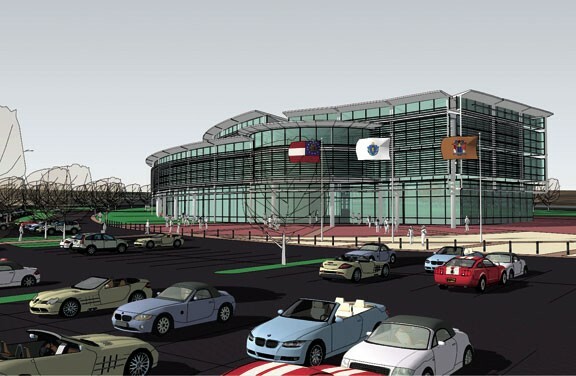 Now, is Gwinnett Tech what we really want? I say it's better than nothing. Would an expansion of Ga Tech or Emory be more prestigious? Yes. But, what is more likely? I think the city should go after it with zeal. Now, what sites would be ideal? How about these two for starters? The south east intersection of Holcomb Bridge & 400 or the Town Center Shopping Center (my favorite town center). Ramping up a college presence takes time but Roswell should really jump on this. It would bring an additional job driver, a more diverse population, and it would encourage some of our youth to stick around and get their education near their home. Now, I do have to add that the one thing that I think would be unacceptable is to build a typical commuter campus with large parking lots and buildings separated like those on office parks. 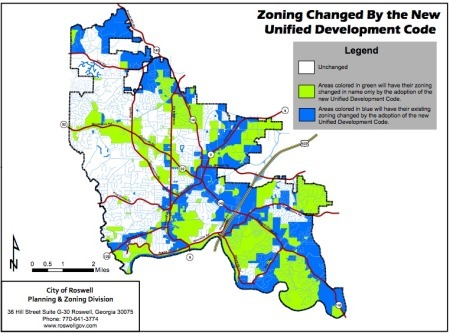 So, whatever would be built would have to be in a district that adheres to the principles of new urbanism.